I've seen in a Mothership studio photo that Mr.Vai has a little carpet under his amp. It's a standard carpet or a special thing for Mr.Vai? Arch - it's called the East Indian Underrug. 6 feet by 4 feet. made by Archstone Authentic Rugs. Model number 234034. What do they sell, wall stuff? man, that paris hilton, i've gotta get me a piece of that. you all be on the lookout for the next paris hilton tape, the one with me in it! I have not used one of these but they look just like a piece of grey rug if you don't look carefully at them. arch wrote: Hi folks again! Could you possible point us to said carpet? A URL maybe, so we can try to help. 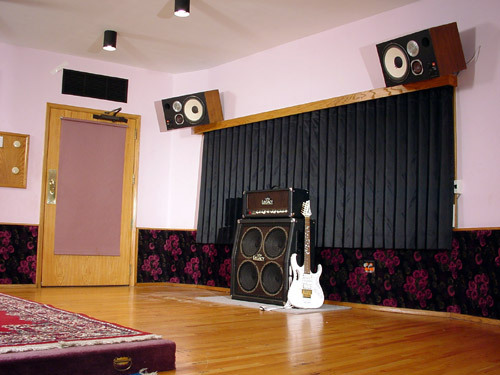 Carpets in the performance room of the Mothership are often used to lessen the sound reflection. The carpet under the amp in the image you're talking about is probably for a couple of reasons: to stop it scratching the floor, to make it easier to move and slide around the room. Apart from that, there's not anything special about the rug. In fact, I think I positioned it there just so I could take a nice photo. That's about it! Don't you think guys handling a Professional Upholstery Cleaner is a very tough task? ?